Home Bathrooms Ideas Shower Debate: Curtain or Glass Shower Door? The age old question remains – which is better? There are plenty of pros and cons when deciding whether you want glass shower doors or shower curtains. Discussing which serves as the most advantageous could provide enough opinion to fuel a robust debate. The truth is their benefits and drawbacks go beyond their appearance and general function. They have a profound effect on your showering experience. When you’re soaking up that hot water first thing in the morning, you don’t need distraction; you just want to concentrate on warming (and waking) up and getting clean. 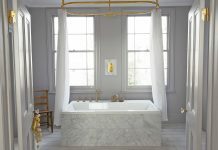 So, outside of how a curtain or door affects showering, the only other factors you should need to consider are budget, maintenance preferences and durability (how long do you expect to keep the curtain or door?). 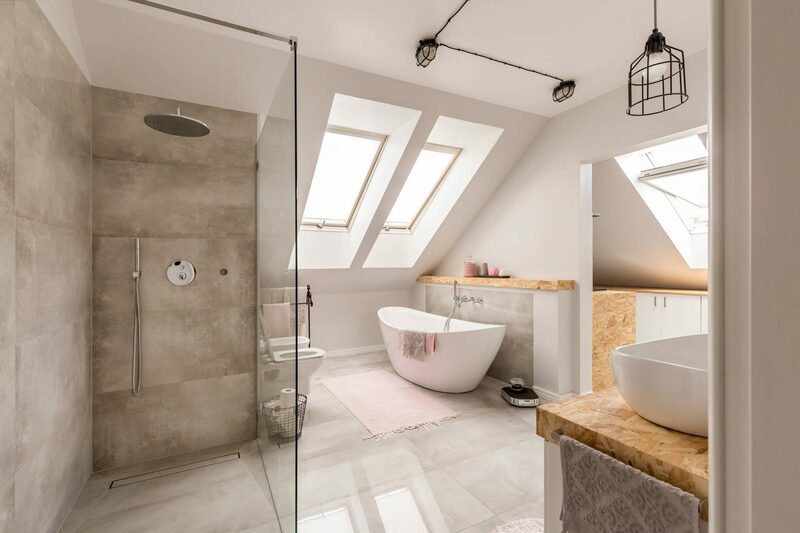 If you have guests over often, and feel that it’s important for the bathroom to be tidy for them, you may decide to close the curtain to keep the tub from view (a must if it’s dirty). Alternately keep it open if there is beautiful shiny porcelain to show off. Shower curtains can be versatile in this respect, just know that you must maintain them properly to keep mold and mildew from growing on their interior surface. Fortunately, they are very easy to maintain, simply wipe them clean. Of course, who can help but to just leave the curtain open without a thought as it drips water to the floor. That’s messy. Perhaps this is why they’re considered the primitive alternative and are often overlooked because they’re not considered as tidy as shower doors – nor as fashionable. So it’s a showdown – shower door vs. curtain! 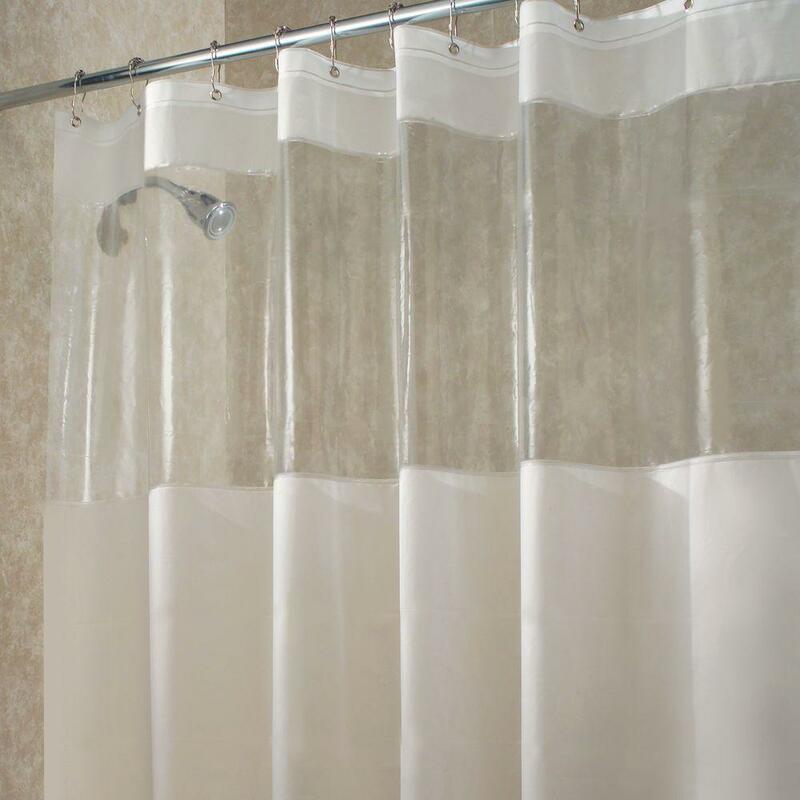 According to the “green set” – people who are concerned about the health of the environment, the vinyl that many shower curtains are made of contain polyvinyl chloride (PVC) – which they claim harbors chemicals that can be hazardous not only to the health of humans such as ourselves but the world around us. It is alleged that new vinyl curtains release volatile organic compounds (VOC’s) and other harmful materials into the air including suspected carcinogens. As a result, massive exposure of these toxins can cause kidney damage and adversely affect the liver and central nervous system as well. Growing children are especially sensitive to the chemicals though exposure via a single shower curtain is minimal at best. There’s been a response to the chemical concern among retailers and a number of major outlets have stopped carrying PVC curtains completely. You may still find them in sparse capacity where they may be grouped with non-PVC alternatives. If you have concerns along these lines, do your due diligence by checking the label. Non-PVC’s are often made from ethylene vinyl acetate, though cryptically named is healthier for people, though still a problem for the environment (due to the polycarbonate-based plastic). Fabric curtains can come in a wide variety of cloth materials and there’s no concern of them emitting potentially harmful chemicals. They are machine washable (always a plus), making maintenance a breeze. One of the durable fabric materials used is hemp, perfect for shower curtains because it is naturally resistant to mold and mildew. You can get them in all sorts of textures and designs (even ruffled!). There’s probably a shower curtain even the toughest critic would be happy with. That brings us to shower doors. Obviously glass doors have been refined so that they are shatterproof, safety tempered (or with glass that’s been laminated) so that they can last a lifetime (unlike the eventual need to replace shower curtains). You can even apply a special coating to shower doors that will protect the surface and keep it easily cleanable. It’s best to keep a small squeegee on hand. After showering, take one minute to ‘squeege’ the insides of the glass doors. It will help resist build up of hard water or lime scale. A sponge with warm soapy water works well, too. But before you replace your shower door with a curtain, don’t underestimate the importance and aesthetic of shower doors. They’re the first thing you notice in a bathroom. They should appear elegant. There are more options for styles and design available than ever before. You can find one to fit any creative vision you can imagine. A frameless series of shower doors creates a greater airy feeling of space. Custom designing a shower door is expensive but the added home equity ultimately makes up for it. Regardless of whether they are framed or frameless showers, they provide a look of integrity. Perhaps this is why many people prefer shower doors to curtains, because they appear to be a bit more refined and civilized. That doesn’t mean there aren’t curtains available to fit into any sophisticated design scheme. The cloth one especially can convey a real sense of class. So which IS better – the curtain or the door? Once you’ve compared the advantages and weighed the disadvantages while considering what appeals to you most, the answer is clear. There is no right or wrong answer, it’s a matter of personal subjectivity – and that’s okay. Once you’re finished with that project, there are plenty of other upgrades you can make to your shower. Take a look! What made me more surprised than the variety of “doors” one can choose for a shower is that choosing one all goes down to one’s preference of a shower experience. I completely agree with this and I would like to add that the budget for having a shower door also includes how much one can invest in maintaining it in the bathroom. This is to ensure that not only will one enjoy using the shower but also keep the bathroom neat and tidy as well. I like that you explain how glass shower doors can add to the aesthetic of the bathroom and can help create an airy and spacious feeling. Since this is the case, it might be a good idea to research online to see what designs are available for shower doors in order to figure out which one fits the style of your bathroom and helps create the feeling you want. You could do this by checking Pinterest, Instagram, and other photo websites to see what other people have done as well as by researching local contractors to find out what designs they offer, which could help you determine which one to hire. 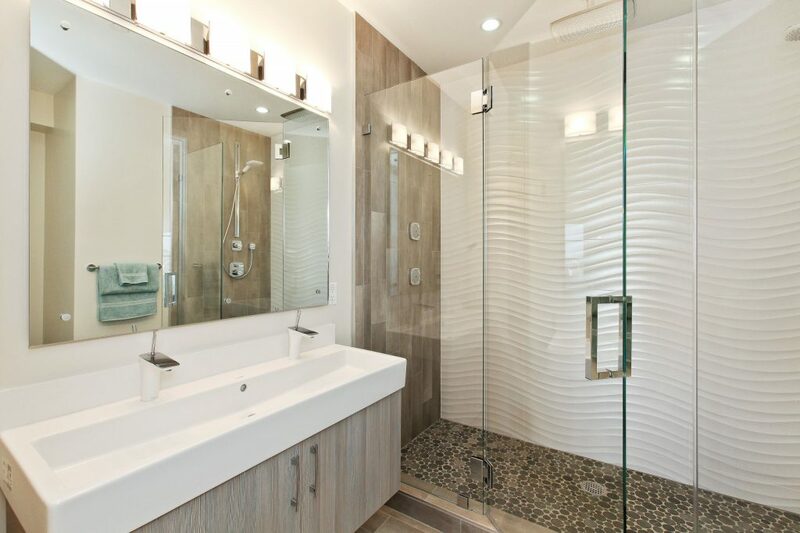 I’m glad you pointed out that glass shower doors provide a great aesthetic and create the illusion of more space. My home’s master bathroom is really small, so we’ve been considering remodeling to maximize the space. I didn’t realize that glass shower doors could create an airy and roomy feel, so thanks for mentioning that benefit!